In Uechi Ryu the kamae ( 構え) is performed with open hands. In this position hands are ready to grab and fingertips ready to strike. As always said by Kanbun Uechi all is in Sanchin. 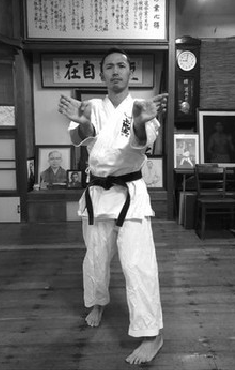 Sanchin is a kata and a specific stance. Sanchin-Dachi (三戦立ち) is the basic stance used in Uechi Ryu it allow to bend body muscles to be strong. Sanchin-Dachi is used too in Goju-Ryu. Shoken Tsuki (初拳突き) is a specific punch performed with the first phalanx. Punching with the first phalanx is a very precise punch targeting one of the 102 pressure point of the body. Shoken Tsuki is used in the most of Uechi Katas. Shaolin hand salute : Shaolin Temple (少林功夫) were mainly dedicated to meditation where lot of martial arts were created. 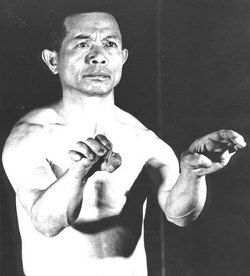 Shaolin Hand Salute is performed with left hand is placed over the right fist. Right hand represents Martial arts ability and left hand represents humility. Using this salute represents respect and peace. Refering to the Yin & Yang concept, open left hand represents Yin and right fist the Yang. 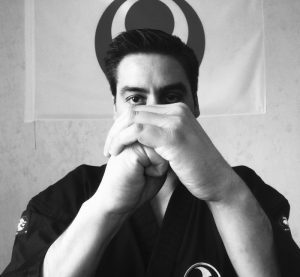 This Hand salute is used at the end of Sanchin kata. By this salute practitioner shows is restraining his attack with his heart.